The tools market has consolidated onto three platforms: Eclipse, Visual Studio, and the Browser. Eclipse - For enterprise class development, virtually all standalone IDE's have moved to the Eclipse platform. Adobe Flex, BEA Workshop, Zend Studio, IBM Rational, and JackBe are examples of independent IDE's that have or have announced a move to Eclipse in the past year. There are virtually no enterprise vendors at this point that are selling a standalone IDE that do not have an Eclipse strategy other than edge cases like IntelliJ and the NetBeans project. When I was at ActiveGrid, 100% (and I am not exaggerating) of Fortune 1000 customers I met had standardized on the Eclipse platform for development. Visual Studio - The Microsoft camp is of course on Visual Studio with its myriad of extensions, but even Microsoft is experimenting with browser-based development with its new Popfly service. Browser - The new and emerging market is browser-based, lightweight application development that used to be dominated by products like Microsoft Access and FileMaker Pro. There are a host of products including Coghead and Zoho Creator that enable a similar ease of use along with the ubiquity of a browser. 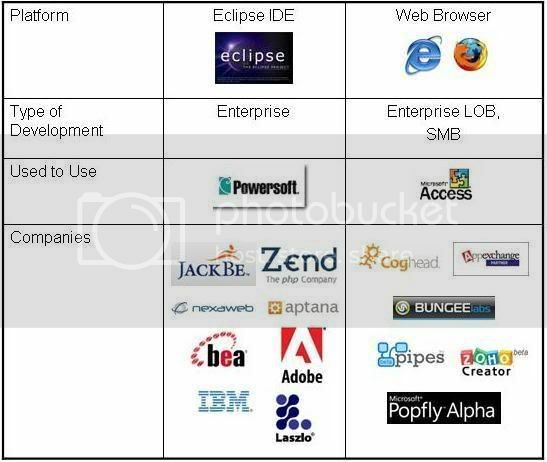 Following is a chart that shows the array of companies offering Eclipse and Web Browser solutions for application development. I did not include Visual Studio in order to save space, it does not have as interesting an ecosystem IMO. It is interesting how the enterprise type of developer that in years past used sophisticated tools like PowerBuilder is still attracted to a full fledged IDE, and the line of business / SMB type of developer that used to use tools like Microsoft Access and FileMaker Pro can now use a web browser. Microsoft has added a ton of features to Microsoft Access over the years, but the core functionality that most people use can now be easily replicated in a browser. With the addition of tools like Yahoo! Pipes and Microsoft's Popfly, the Web 2.0 wave has finally hit application development in a big way.